As many of you know, my wife and I recently took a missions trip to Brazil (photos | video highlights. We were invited by Ed Alexander to participate in their annual music conference and sing/preach in some area churches. I thought I’d give a summary and some reflections here from our trip. In many ways, we feel like we were taught and ministered to more than what we contributed. But before I detail some of what we learned, let me summarize what we did while we were there. We left on Monday, July 5, spent a long layover in Washington D. C., and then traveled through the night to Sao Paulo. After going through customs, we took a short flight to Curitiba, a fairly large city where the music conference was to be held. We rested Tuesday afternoon through Wednesday afternoon, and the conference began Wednesday evening. 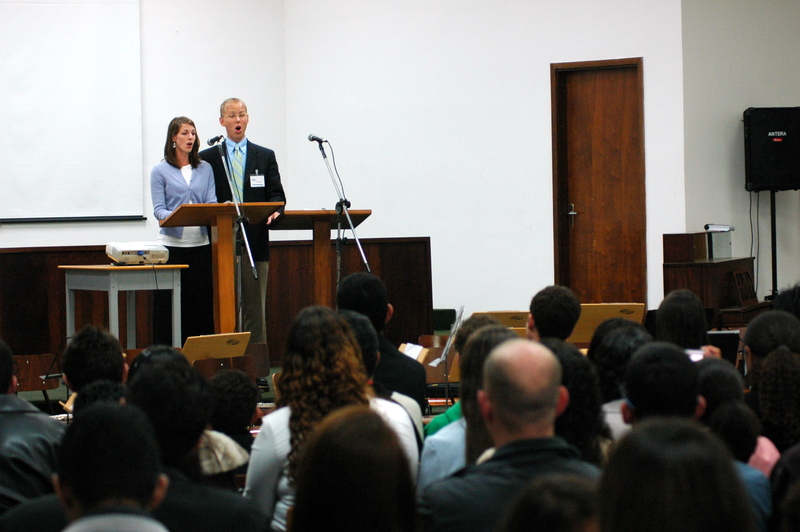 Ed Alexander, aided by his wife Jan, serves as director of the Seminario Batista Regular do Sul (The Regular Baptist Seminary of the South1 ). 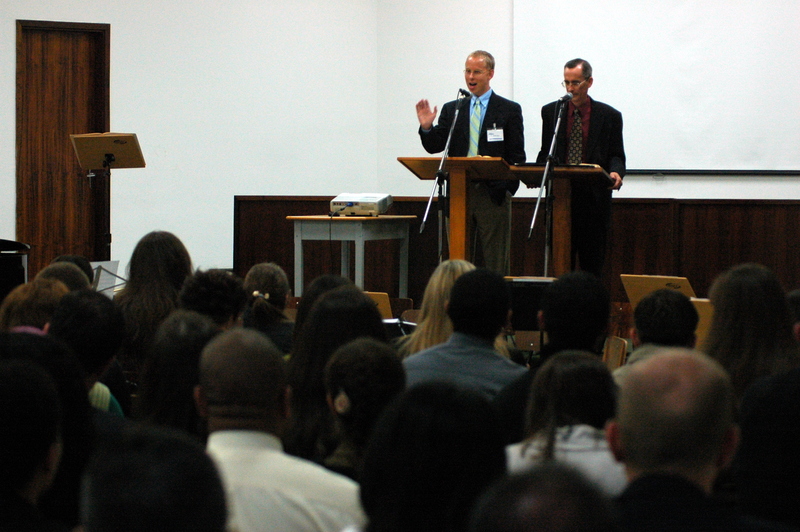 The seminary offers undergraduate and graduate degrees in Bible. 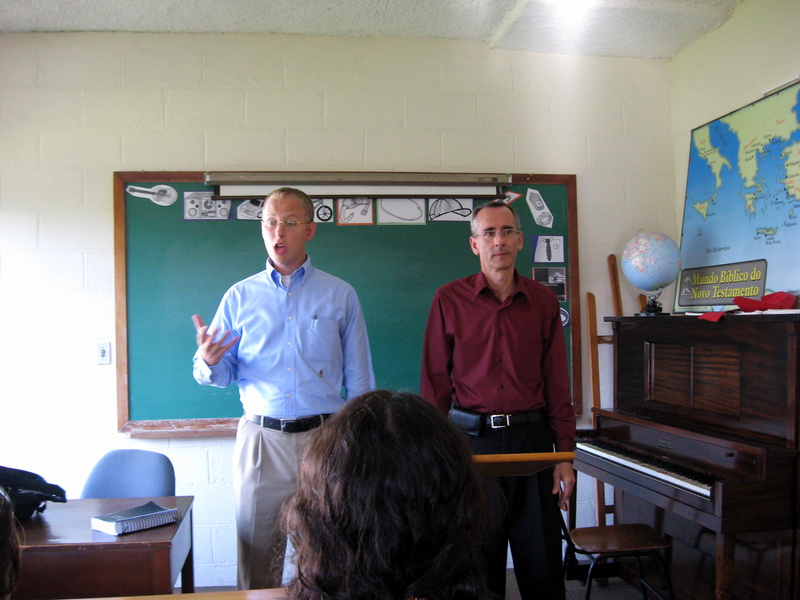 The Alexanders have served in Brazil for almost 30 years, planting several churches further north, but Ed accepted the invitation to direct the seminary about 3 years ago. Even before accepting the position, the Alexanders along with a few others started the music conference. This year was the sixth year and had the highest attendance ever of around 100 people. Vans and buses came from as far as 12 hours away to attend this conference. The conference began Wednesday evening. Becky and I sang several songs in both Portuguese and English, I played trombone, some others from the seminary presented musical offerings, and I preached, “Does Music Matter?” I had to preach through a translator, of course; I enjoyed working to get into the right “rhythm” with Ed Alexander and fellow missionary Paul Van Loh. I had preached most of the messages previously through an interpreter in an Arabic church in Detroit, so that helped to give me some practice. Thursday the conference started early, and continued all day and through Friday evening as well. In total, I preached 5 general sessions (“Does Music Matter?”, “Is the Bible Enough?”, “Biblical Discernment,” “Making Musical Choices,” and “Why Do We Sing?”). I also taught a two part workshop on simple arranging for the church choir. That, especially, was difficult to do through an interpreter! Becky taught a two part session to the ladies as well. We also sang several songs in each service, many in Portuguese. I especially enjoyed singing a duet in Portuguese with one of the seminary students, Jaime, who has a beautiful tenor voice. What was most remarkable and surprising to me was the number of Brazilian nationals who were involved in teaching and directing during the conference. Becky and I, the Alexanders, and Paul Van Loh did some of the teaching and directing, but many of the workshops and musical groups were led by nationals who had come up through the seminary and Jan Alexander’s musical training. Each evening, all of the conference participants presented a combined choir and orchestra number as well, which was very impressive! This was clear evidence of the impact of this conference and the ministry of the Alexanders and Van Lohs over many years. Although the language barrier prevented us from having lengthy conversations with the conference participants, we did feel a fellowship with them that can only be explained by a unity in the gospel and a common musical expression. We were able to have many good conversations through interpreters, though, and some of the nationals liked to practice their English on us as well! We were impressed by the desire for biblical worship and music and a hunger for presenting an excellent offering to the Lord. What a wonderful and unique ministry this conference is every year; we were privileged to participate. On Saturday we rested and saw some of down town Curitiba. 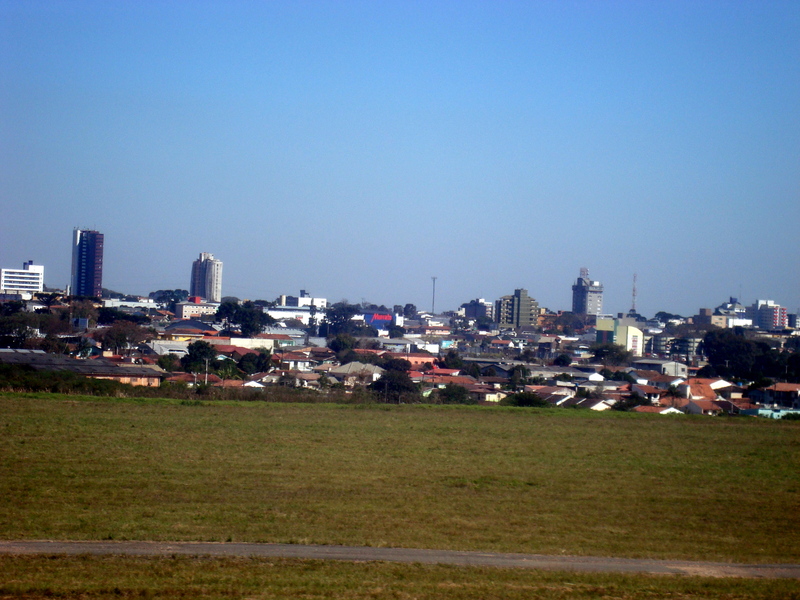 It is a fairly large city, the capitol of the state of Parana. On Sunday, we ministered in two area churches. It was a joy to see these churches that are trying to reach their communities for Christ. By Monday morning we were absolutely exhausted, yet satisfied with the ministry we were able to enjoy. Monday and Tuesday we enjoyed seeing some of Brazil. 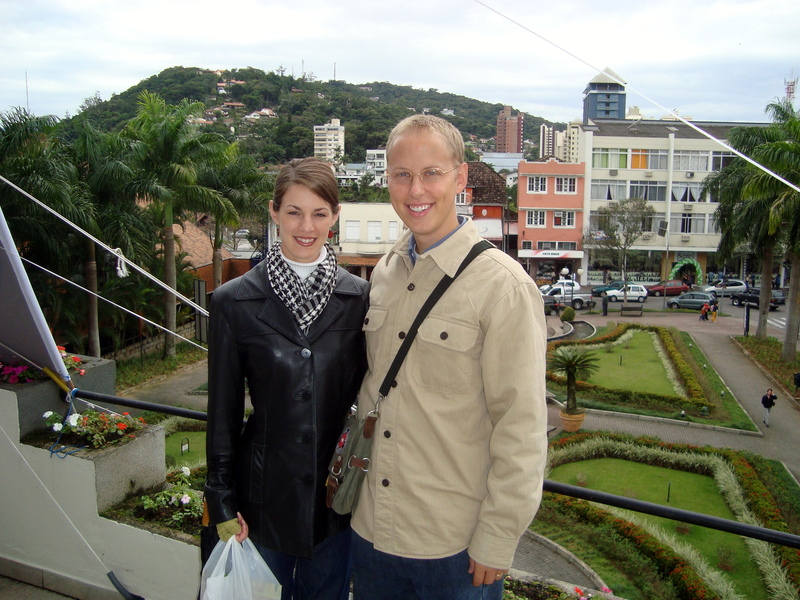 We traveled with the Alexanders a few hours south to a German town called Blumenau. Really, southern Brazil was much more European than we had ever expected. Looking at the average crowd, you would think you were in the states; whites, browns, blacks, asians . . . they were all there! The further south you go, the more German it gets, and this is where we enjoyed two days of sight-seeing. We were able to see the coast, and spend the night at a cute hotel in Bluemnau, where we did some shopping and saw the sights. The highlight of that trip was that we found an old Lutheran church that had been founded in 1868. Since Brazil is predominantly Roman Catholic, this was a rare sight. Not only did we get to see this beautiful building, but the church organist favored us with a Bach Prelude and Fugue on the church’s pip organ! 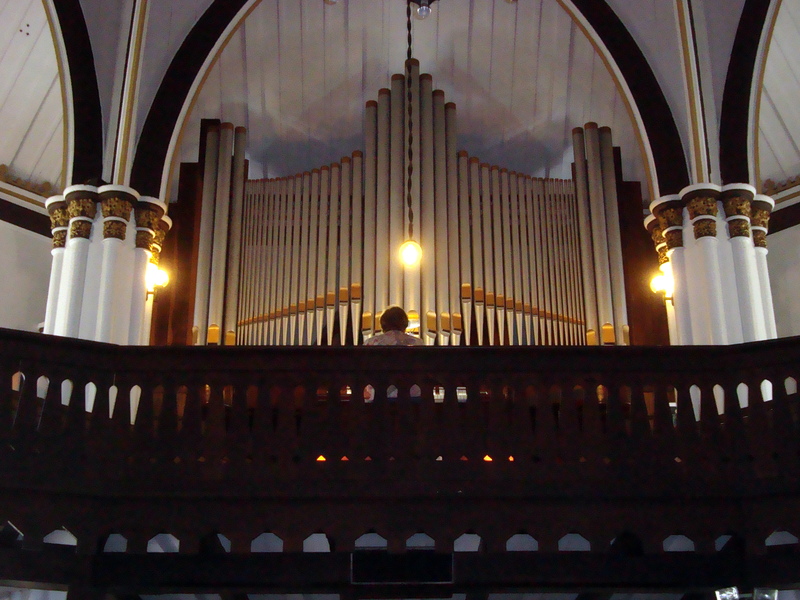 I never expected to hear Bach on a pipe organ in a Lutheran Church in Brazil! On Wednesday we shopped for some souvenirs and had lunch with the Van Lohs before taking off for Sau Paulo and then home overnight again. Wednesday morning, however, was another highlight of the trip. Recently graduated from the seminary is a man named Rober (pronounced Hober). He is a native Indian from the Tikuna (pronounced Chakoona) tribe in the Amazon. As far as anyone knows, he is the first native Tikuna Indian to have graduated from an independent Baptist seminary anywhere in Brazil. The gospel reached his village about one generation ago through some missionaries, and I had a chance to sit down with him and talk about his culture, music, and the gospel. I recorded the conversation and plan to edit it for a podcast in the near future, so I won’t give away the content of our meeting yet. But his perspective about culture and the gospel ran contrary to what most popular missiologists will tell you today, and I can’t wait to share it with you. Several things stood out to me during the trip. The first was the culture. I really hadn’t known what to expect. We knew Curitiba was a city, so we didn’t expect thatch huts or anything. But as I have already mentioned, much of Brazil, especially the south, is very European. Even the north, unless you are actually in a tribe in the Amazon, is a melting pot of many different cultures. Really, there is no distinct Brazilian culture per se. They do many things differently, no doubt. But there is not much by way of cultural expression that you can point to and say, “That’s Brazilian.” In fact, Western pop culture has so pervaded Brazil, that in many ways the musical sounds you hear are no different than what we hear around us in the states. It is certainly true that pop culture kills all other forms of culture. The Alexanders told us stories of hearing American pop songs in stores, and Brazilians would say that they are their favorite songs while at the same time asking the Alexanders what they mean in English. It is clear that they enjoy the sound of the music and really don’t care about the lyrics. The universal language of music feeds the same sinful appetites of Brazilians as it does Americans. But not all the Western influence is bad. When Brazilians (Christians or non-Christians) think of noble musical expressions, they think of music from the Western Classical tradition. 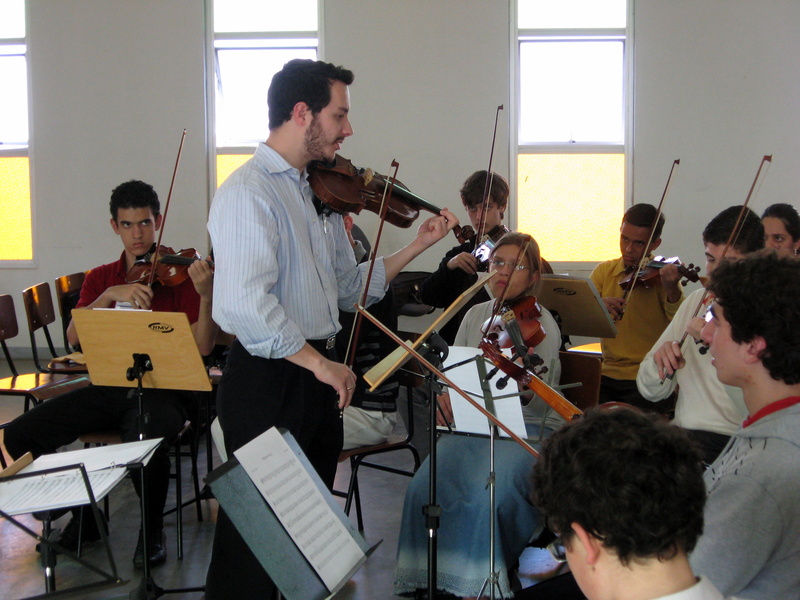 Even Curitiba has a music conservatory where many people associated with the seminary have or are currently receiving education. The conclusion I came to is this: the notion that Western imperialists have invaded foreign cultures like Brazil and have imposed their culture is silly. The Brazilians have chosen Western culture themselves, whether to indulge themselves in the debauchery of pop music or to ennoble themselves in the masters of the Classical tradition. For American missionaries to come in and introduce the Western hymnody of Watts and Wesley to the Brazilians is not foreign to them. It is already the musical language they speak. This point became even more clear in my conversation with Hober. Stay tuned for the audio of that conversation. "Recognition of Christ's Lordship fulfills the purpose of the Father and so brings glory to God." The second important point that stood out to me from the trip was the absolute necessity of strong music ministries to compliment missions activity. For some reason we Christians in the states see church planting as important and worthy of our financial support (which it is indeed), but we would never financially support a music ministry in a missions context or even a missionary who wants to go to a foreign field for the primary purpose of teaching music. Somehow we see that as inferior. 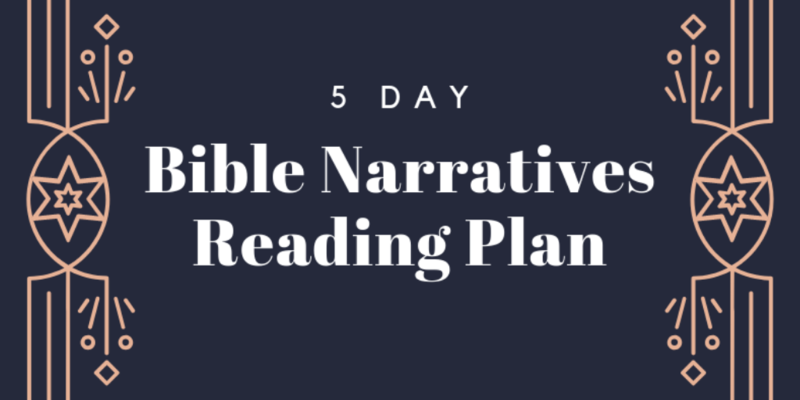 I plan to write on this more in the weeks ahead, but story after story in many foreign fields attests to the fact that without strong teaching on worship and music, many church plants eventually fall into theological error, Pentecostalism, or even collapse. This is certainly true of Brazil. 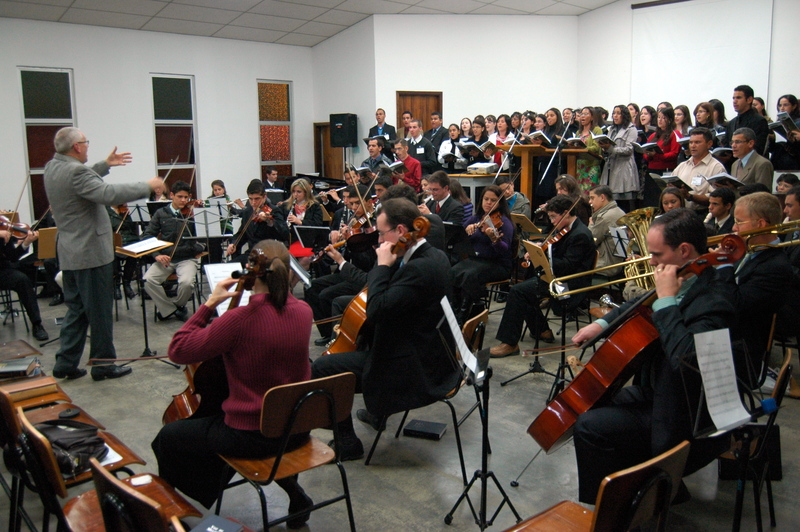 The churches in Brazil simply do not have the musical resources that we have in the states. Whether it is hymnody, instrumental music, or choral music, the pickings are limited, especially if you are convinced of the necessity of conservative music. The Van Lohs began a music publishing ministry several years ago, and the Alexanders try to publish a choral book once per year, but even they have limits to what they can produce. The Alexanders told me stories of missionaries who wanted to come on the field to teach music and publish materials, but couldn’t receive enough support from the states. I have been burdened to do more to emphasize the great necessity of music teaching and publishing in foreign fields, and I hope to do so in the future. I hope this gives you a small taste of what we experienced in Brazil. And as I mentioned, this is not the last I will be writing about it. I plan to do at least the podcast interview with Hober and an essay on musical missions, so stay tuned.